Order Now Ordinarily, Charleston's Indigo Tea Shop is an oasis of calm. But when tea shop owner, Theodosia Browning, caters the annual Lamplighter Tour of historic homes, one of the patrons turns up dead. Never mind that it's Hughes Barron, a slightly scurrilous real estate developer. Theodosia's reputation is suddenly on the line. Aided by her friends and fellow tea shop entrepreneurs, Theo sets about to unravel the mystery of the deadly Darjeeling and encounters a number of likely suspects. Tanner Joseph, the fiery environmentalist, held a grudge against the developer for his misuse of land. Timothy Neville, the octogenarian major domo for the Heritage Society, opposed Hughes Barron's election to the board. And Barron's unsavory partner might very well profit from a cleverly written buy-sell agreement! Order Now Charleston's annual Isle of Palms Yacht Race is the perfect occasion for boiled crab, iced tea, and social téte-a-tétes. From their vantage point in White Pine Garden at the top of the Historic Peninsula, Theodosia Browning and her fellow picnickers watch sleek J-24s hurtle towards the finish line, masts straining, spinnakers billowing. But the dramatic battle between Charleston's two rival yacht clubs turns tragic. The ancient Civil War pistol used for the traditional finishing line gunshot suddenly explodes, killing the patriarch from one of Charleston's oldest families. As her neighbors go into mourning, Theodosia begins to unravel a family secret that stretches back over a hundred years, making her wonder: Was this truly an accident--or murder? 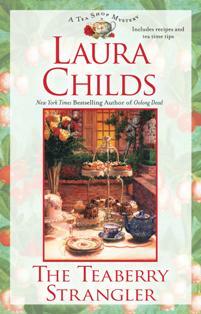 Order Now An antique wedding ring mysteriously disappears from the hand of a dying bridegroom. Then a priceless sapphire necklace is plucked from its display at the Heritage Society. Could there be a very dangerous breed of cat burglar prowling the cobblestone pathways of Charleston's historic district? With the Heritage Society under fire and their extravaganza Treasures Show fast approaching, Theodosia is called upon to match wits with a very slippery opponent. Order Now Dawn is about to break at South Carolina's Halliehurst Beach, and the members of Charleston's Sea Turtle Protection League are taking part in the annual "turtle crawl." As they help hundreds of tiny green loggerheads tumble safely into the surf, the dedicated volunteers congratulate themselves with a well-earned shore breakfast. But as the tea steeps and the gumbo simmers, a strange mass is spotted floating off-shore. Donning mask and swim fins, Theodosia paddles out to investigate, only to discover a dead body bobbing in the waves. The hapless victim turns out to be Harper Fisk, a prominent Charleston art dealer and passionate collector of Civil War antiquities. Rumors of sunken treasure and gold bullion have abounded, yet nothing has ever been found near Halliehurst Beach. But now Theodosia begins to wonder--did Harper Fisk finally stumble upon something? And was he killed because of it? Order Now The traditional Ghost Crawl in Charleston's Jasmine Cemetery is an annual autumn event. Under a full moon, amateur actors attired in Civil War-era costumes re-enact historic scenes with a flourish of pageantry and pomp. But as stage lights flicker and dim, and actors appear and disappear among ghostly gravestones, something goes terribly wrong. Dr. Jasper Davis, Jory Davis's uncle, clutches his chest in pain and collapses. Even though the paramedics arrive moments later, Theodosia soon learns that their heroic efforts were in vain. For nothing could have revived Jury's uncle from a mysterious and toxic does of Fentanyl! Order Now Spoleto Festival ushers in a two week explosion of music, art, theater, and dance for Charleston. But during the Heritage Society's first-ever Poet's Tea, Roger Crispin, the head of Charleston's staid auction house Crispin & Weller, ends up a hapless performance art victim. Order Now Candles flicker and shadows dance on the wall of an historic old house as guests at the Candlelight Concert sip sweet blood orange tea. But when one poor guest suddenly collapses and real blood beings to spurt, tea and trouble are brewing for Theodosia and company. Order Now It's springtime in Charleston, and just about every species of South Carolina flora and fauna is in bloom during the annual Spring Plantation Ramble. While tea shop owner Theodosia Browning serves Dragonwell sweet tea, guests mingle, enjoy flower shows, and bid at a rare plant auction. Festivities come to a screeching halt, however, when commodities broker Mark Congdon is high bidder for a rare monkey-face orchid, then promptly drops dead. It looks like a simple heart attack, but Theodosia suspects otherwise and looks for answers in the nearby Nightshade Garden. Order Now The Charleston Film Festival is under way, and Theodosia Browning and her staff of the Indigo Tea Shop have a busy week of catering jobs. First up is the opening night gala at the renovated Belvedere Theatre. But as tinseltown bigwigs mingle with local luminaries, famous director Jordan Cole is shot on his way to the podium, and the entire audience witnesses his death--larger than life and silhouetted against a white scrim. When two judges quit, festival organizer Timothy Neville asks Theodosia to step in. She reluctantly agrees--only to get pulled into an investigation that's as perilous as any big-screen thriller! 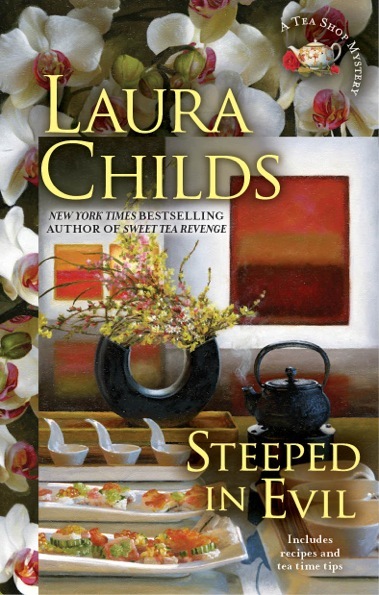 Order Now A wild steeplechase through the Carolina low-country brings Theodosia face to face with a dead woman--and sparks the return of a boyfriend she never thought she'd see again. Order Now A back alley candlelight tour ends in murder and sends Theodosia seeking justice for a friend. But who stands to benefit from inheriting a map shop, how are the ladies from Jardin Perfumerie involved, and why is a mysterious stranger suddenly stalking her? 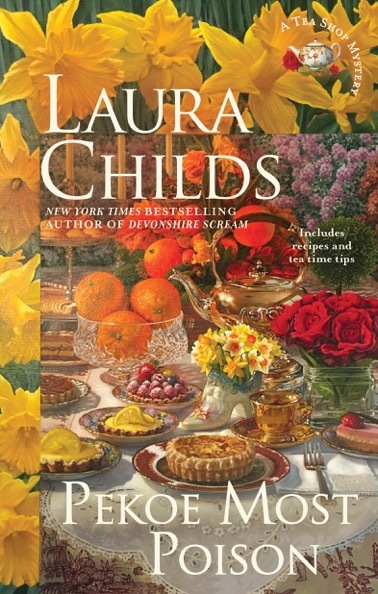 Order Now As Charleston’s Food and Wine Festival gets underway, Theodosia and the Indigo Tea Shop gang introduce the hottest new culinary trend – tea and cheese. But with a shocking murder, raft of suspects, and a bungled investigation, something smells funny. And it’s not just the Gorgonzola! 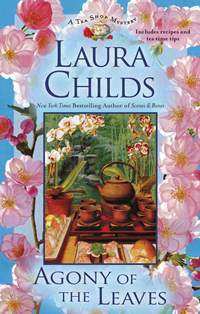 Order Now Theodosia becomes the Maid of Dishonor when a dream wedding kicks off with an unexpected bang. 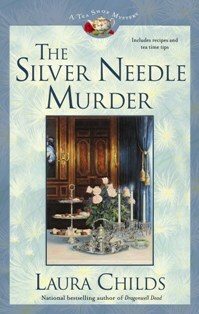 And something old, something new, something borrowed, something blue become clues in a murder investigation! 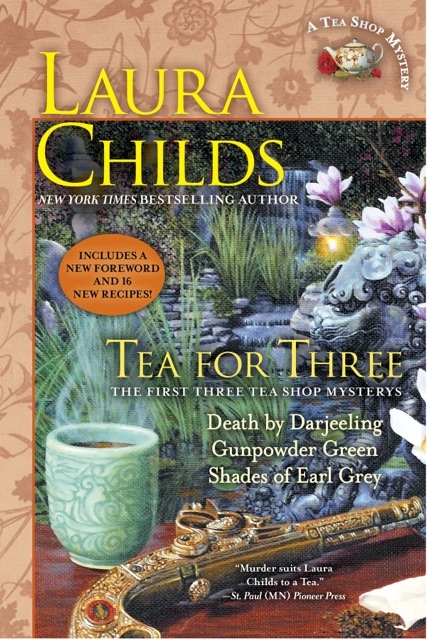 Order Now This anthology contains the first three Tea Shop Mysteries--Death by Darjeeling, Gunpowder Green, and Shades of Earl Grey. This is where it all begins, of course, with Theodosia and her tea shop dog Earl Grey, Drayton, Haley, and a wonderful cast of characters. 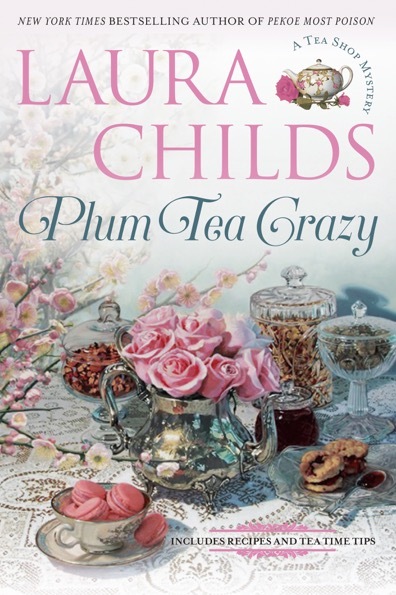 For tea lovers who haven't read the books yet, this is the perfect starter! Order NowTea may be Theodosia Browning's forte, but that doesn't stop her from attending a posh wine tasting at a local vineyard. Unfortunately, terrior turns into sheer terror when a barrel of Cabernet is pried open and a dead body sloshes out! 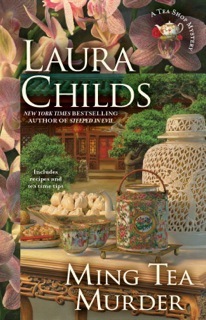 Order NowWhat begins as a black tie event to celebrate the reconstruction of an antique Chinese teahouse suddenly spirals into murder. Who is this killer with a taste for blood and impeccable taste in Chinese art? Can Theodosia find him before she becomes a target, too? 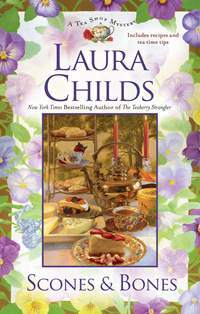 Order NowIn this fast-moving cozy-thriller, tea shop maven Theodosia Browning gets caught in a daring "smash and grab" raid during a fancy soiree at Heart's Desire Jewelry. Could the ringleader be a wealthy yacht broker, transplanted European, motorcycle-riding tough guy, or mild-mannered professor? 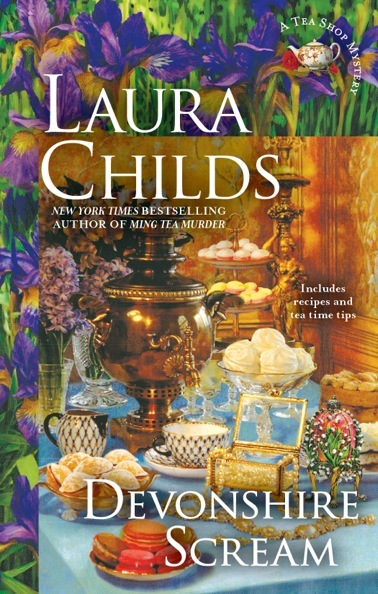 The FBI thinks international jewel thieves are at work, but when the Heritage Society decides to put a priceless Faberge Egg on display, Theodosia takes matters into her own hands. Order Now Eighty years ago, fancy "rat teas" were all the rage in Charleston. Now, a society doyenne had revived that quaint custom as a madcap homage to the city's colorful past. Only problem is, a sip of the wrong brew and someone turns up dead. Theodosia may not be to blame, but she certainly won't turn a dim eye to this affront against tea! 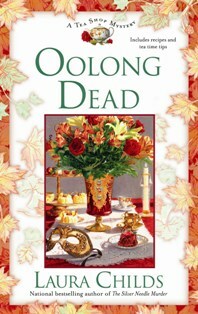 Order Now With a murder during the Gaslights and Galleons boat parade, and then strange goings-on at the Carolina Cat Show and Rare Weapons Show, what else could possibly happen to rock Theodosia’s world – except perhaps a second murder? 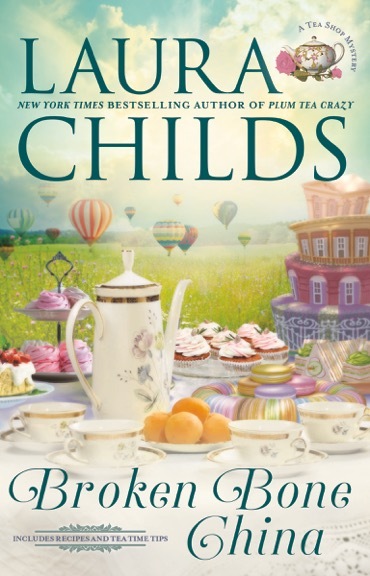 Order Now As a hot air balloon ride ends in murder, an early-season hurricane complicates the investigation and sends Theodosia and Drayton scrambling for clues. 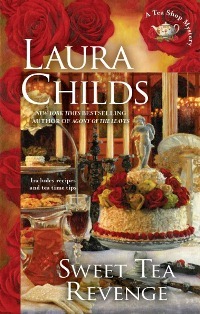 © Laura Childs. All rights reserved.